Bay leaf tea is a herbal infusion made from the dried, whole or ground leaves of the bay leaf or bay laurel herb (Laurus nobilis). 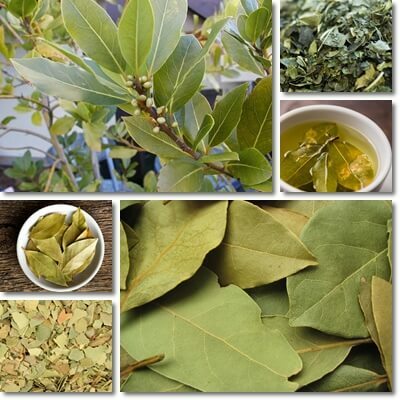 Bay leaf tea holds benefits for diabetes management, having blood sugar-lowering activity, exerts anti-inflammatory and antimicrobial properties, anxiolytic effects and is commonly used for stress relief. Other bay leaf species may be used to make bay tea, such as California bay leaf (Umbellularia californica), Indian bay leaf (Cinnamomum tamala) or West Indian bay leaf (Pimenta racemosa). However, there are somewhat notable differences in the aromatic compounds profile between the different bay laurel species which may affect both flavor and medicinal usage of the tea. 1) From whole leaves: Add 3-5 dried, whole leaves to a pot of water (about 2 cups) and bring to boil. Boil for 3-5 minutes, then let the leaves steep for 5-10 minutes. The longer you steep the leaves, the more flavor should get released into the tea water. 2) From loose ground leaves: Add 2-3 teaspoons of dried, ground bay leaves to a pot of water (about 2-3 cups) and bring to boil. Boil for 3-5 minutes, then let the ground leaves steep for 5-10 minutes. Considering the tea leaves are loose, filter the tea before drinking. 3) From tea bags: Prepare the tea according to producer instructions. For a stronger flavor, let the tea bags steep several more minutes past recommended time. Optional step: Sweeten the tea according to taste. A healthy option is raw honey, whether it’s acacia, clover, sunflower, manuka honey or any variety most to your liking. You can choose any type of honey you like, just remember to use raw honey and add it to the tea after it’s cooled down (see Honey Varieties page). Adding it to the boiling herbal infusion or mixing it in the steeping hot tea can affect its therapeutic properties, reducing its remedial potential. But avoid the product if you are allergic to it, honey bees or the pollen of the flower species from which the honey is made – all honeys contain a certain amount of pollen. What is bay leaf tea good for? The health benefits of drinking bay leaf tea regularly range from blood sugar-lowering effects to stress relief, anti-anxiety action, anti-inflammatory and antimicrobial properties as well as benefits for digestion, including relieving bloating and associated discomfort, heartburn from acid reflux and reducing stomach acidity. The range of action of the biologically active compounds released in the tea is varying and so the benefits enjoyed may differ from person to person. Herbal teas are a great means to relax, lowering stress and anxiety levels. On the one hand, it’s about the quietude of the moment, the tranquility, the experience of tea drinking itself. The fact that it’s a warm beverage furthers feelings of calm and peace. On the other hand, biologically active compounds found in bay leaves and bay leaf tea, such as myrcene, limonene, linalool and alpha-pinene, have mild sedative properties and can even encourage muscle relaxation and possible also help with better sleep whilst contributing to reduced anxiety levels. Also see these 9 great anti-anxiety herbal remedies. In vitro experiments have confirmed the blood sugar-lowering effects of bay leaves. Supplementation with 1, 2 and 3 g of finely ground bay leaves has been shown to lower fasting blood sugar in type 2 diabetics by up to 26%. The biologically active constituents behind the hypoglycemic effects of the herb are believed to be polyphenolic antioxidants and aromatic compounds such as myrcene. For example, studies show the compound myrcene to improve glucose tolerance in diabetic rats. Bay leaf tea is believed to have similar benefits for lowering blood sugar in diabetes as the ground leaves since the tea brewing process allows for the biologically active constituents with this particular therapeutic action to be released into the tea water. However, more research is needed to understand to what extent regular consumption of the tea produces blood sugar-lowering effects in diabetics, compared to supplementation with the ground leaves. In the past, bay leaves were known to possess antimicrobial properties and would be used to dress wounds to prevent infection and encourage faster healing. It is now known that the antimicrobial value of the bay laurel comes from aromatic compounds that give it its particular flavor profile. And these compounds are released into the tea water during brewing, resulting in bay leaf tea having some degree of antimicrobial action, more exactly antibacterial and antifungal. Bay leaves contain cineol, alpha-pinene, beta-pinene, myrcene, limonene, linalool, methyl chavicol, neral, alpha-terpineol, geranyl acetate and eugenol, all aromatic oils with antibacterial and antifungal properties. Biologically active compounds in bay leaves and its by-products, tea and oil, exhibit anti-inflammatory and even analgesic properties. Myrcene, found in bay laurel, West Indian bay as well as lemon grass, cardamom, basil and parsley, has been found to have strong anti-inflammatory properties as well as achieve pain-relieving and sedative effects. Eugenol, found in bay laurel species and also cloves and cinnamon, produces powerful anti-inflammatory effects and acts as a natural analgesic as well as local anesthetic and antiseptic action, hence its use in dentistry. Bay leaf tea holds antibacterial, antiseptic, anti-inflammatory and even analgesic properties which can be attributed to its varied aromatic profile. As an antibacterial and antiseptic, it can help prevent local bacterial overgrowth (mouth, throat). Its anti-inflammatory and even analgesic properties help relieve inflammation and pain associated with a sore throat and caused by either bacterial respiratory infections or viral respiratory infections such as the common cold or the flu. Also read about the flu and fainting. Bay leaf tea is further believed to hold some astringent properties and recommended for clearing mucus from the nose and throat (although this effect can successfully be achieved by drinking plenty of liquids). Lastly, the tea is drank for cough suppression and the compound responsible for such as effect is eucalyptol or cineole. Bay leaves are also a great source of dietary vitamin C and zinc, two strong immune system strengthening agents with antimicrobial action. However, the vitamin C and zinc content cannot be considered if the herb is consumed in an infusion/tea because, one the one hand, vitamin C is destroyed by cooking heat and, on the other hand, zinc is not delivered in the tea water in amounts sufficient to produce visible biological effects. Due to its varied aromatic profile, bay leaf tea makes a great natural digestive aid. One of its biggest benefits for digestion is relieving bloating, flatulence, even hiccups and burping as well as stomach discomfort or colic pain associated with the bloating. Cloves and peppermint and ginger tea have a similar therapeutic effect to bay laurel tea. Drinking bay leaf tea can, in some instances, hold benefits for stomach acidity. First of all, by relieving bloating, there is less stomach acid being forced up the esophagus along with air, resulting in a reduced incidence of stomach acidity. 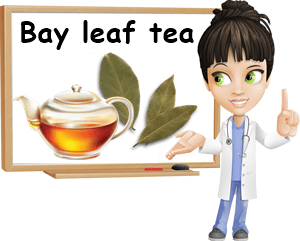 Bay leaf tea also furthers digestive health in general and can actively help with conditions such as acid reflux disease, both soothing discomfort produced by heartburn and helping with poor digestion or indigestion which can fuel acid reflux.